Small automaker Suzuki celebrates its centenary this October. Back in 1909, Michio Suzuki founded the Suzuki Loom Company in Hamamatsu, Southern Japan and it was while manufacturing looms for production of plain white fabric he learned that weavers wanted looms that could produce cloth with vertical and horizontal stripes. So he developed a unique loom capable of weaving patterned cloth from dyed yarn. Suzuki’s new innovation represented the start of an uncompromising focus on creating products that meet people’s needs and realize new lifestyle possibilities. Suzuki expanded into production of motorcycles in 1952 with the ‘Power Free’ using a 36 cc two stroke engine. The Power Free was simple in design, offered very easy maintenance and was unique at that time as it could be ridden fully motorized, partially motorized or by using the pedals without any engine assistance. Just a year later, Suzuki was building 6,000 motorcycles per month. 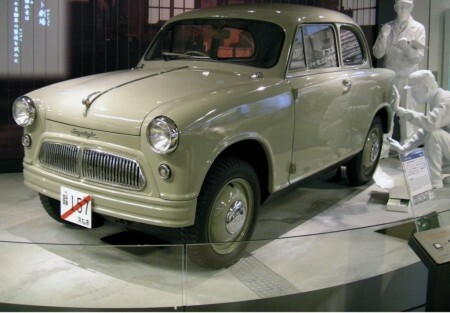 Suzuki car production began in 1955 with the Suzulight, a compact car with a 360cc two-stroke engine. The Suzulight was one of the first cars to feature front-wheel drive, four-wheel independent suspension and rack and pinion steering. Suzuki’s off-road vehicle heritage began in 1970 with the launch of the LJ series lightweight 4×4. The first Marine outboard motor was introduced in 1965, then pre-fabricated houses in 1974; general-purpose engines in 1980 and its first All Terrain Vehicle (ATV) in 1982. Aggregate car production topped 10 million units in 1989, and global annual production exceeded 1 million units by 1990. Since then, Suzuki has continued to enjoy growth in demand; its annual car production breaking the 2 million units barrier in 2005 and total car production reaching 40 million units in 2008. 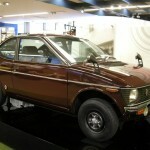 Demand for Suzuki cars in Europe has also shown steady growth and cumulative sales have recently reached 4.5 million units since 1968 when exports began with the Fronte. In 2008, Suzuki sold 2.3 million cars globally and European car sales amounted to 315,000 – strong results for the brand despite very difficult current trading conditions. Sales of motorcycles are also strong with global sales of 3.4 million last year. In the UK, Suzuki has led the market for the last six years in the above 126cc category. The same creativity and dedication of Michio Suzuki underpin Suzuki’s development of its world strategic models. The first one in this category, the Swift, is produced in Japan, Hungary, India, China, Indonesia, Taiwan, and Malaysia. The current Swift was introduced in 2005 and last year, aggregate production of the supermini reached 1 million units. 2009 is also a celebration of 25 years of Swift in Europe. In 2006, Suzuki created its second world strategic model, the Grand Vitara, as an evolution of the first-generation Vitara series, with which it pioneered the market for compact sport utility vehicles 21 years ago. Worldwide production of the Grand Vitara has now reached 2.6 million units. The third model, the SX4 sport crossover, proved to have such outstanding chassis potential when launched in 2006 that Suzuki ran it in the World Rally Championship in 2007 and 2008 (45 years after Suzuki’s participation in the first Japanese Grand Prix in 1963). Whereas the Swift, Grand Vitara, and SX4 reflect a focus on sportiness, the fourth Suzuki model, the Splash, reflects a focus on families and highlights the effectiveness with which a compact car can meet family needs. Suzuki’s important European manufacturing plant is based at Esztergom in Hungary. The plant has the capacity to build more than 280,000 units and produces Swift, SX4 and Splash which is the first model Suzuki has exported from Europe back to Japan. Production of the Splash recently started in India for their domestic market. In March this year the seventh generation Alto was launched; named after the car with which Suzuki has dominated the mini vehicle segment in Japan for 30 years, the Alto is the smallest of Suzuki’s world models and reflects a focus on eco-friendliness with emissions of just 103g/km and combined fuel consumption of 64.2mpg. Alto is built near Delhi, India, a continent where Suzuki has a 50 per cent share of the passenger car market. 2009 is also an important milestone for Alto as 10 million have been sold globally since 1979. 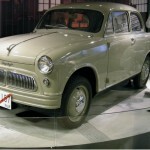 Indian car production began in 1973 with the Maruti 800; a low cost family car that brought mobility to millions. To put this into perspective; of the 11 million passenger cars currently on the roads of India; more than seven and a half million are Suzuki’s and four million of those are Alto’s. Looking to the future; Suzuki plan to concentrate strongly on lowering emissions even further and presented Stop / Start concepts as well as a new variable valve timing system at the Geneva Motor show. This technology will reduce emissions of Alto to 95g/km and Splash to 109g/km. In the longer term, further development includes the eventual introduction of Hydrogen fuel cell technology for its medium size vehicles and Suzuki recently tested an SX4 Fuel Cell Vehicle (FCV) on public roads in Japan. 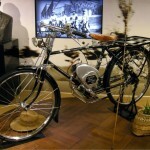 To celebrate 100 years of innovation Suzuki is showcasing its history and manufacturing prowess at Suzuki Plaza, a three storey heritage centre in front of its headquarters in Japan.